Craig Jones’ professional resume reads like an MBA textbook: “IT Operations and Delivery, outsourcing, SCM, Six Sigma and lean manufacturing,” etc. He travels worldwide as a Managing Director for the consulting firm Accenture and most assuredly, the Australian native casts an impressive shadow. 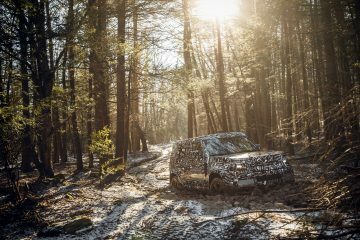 There’s another Craig Jones, “Jonesy,” the avid Land Rover enthusiast whose Series Land Rovers and Defenders have carried him on trails from Maine to North Carolina to Colorado. 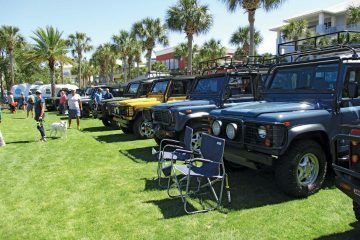 At any off-road event his ebullience, generosity and raucous laughter assure everyone presents a great time. Raised in Perth, Australia, the West Australia Tech graduate spent time in London and Kenya before arriving in the US in 1994. He lived in Brimfield, CO, before moving to his current home in Leesburg, VA, for his current position as a Managing Director of Accenture. Craig always looked happy in “Ruby,” his previous Defender 110. 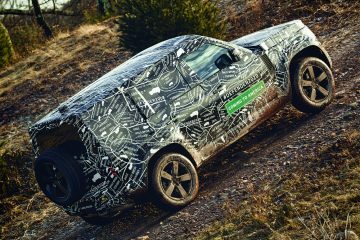 While well kitted-out with off-road kit such as air lockers, it looked quite stock and rumbled nicely with its 200 Tdi engine. However, Craig’s tall, lanky frame always made him feel scrunched, so he put it up for sale and brought a unique Lightweight to the 2018 MAR last October. There he related the story behind this remarkable build. He remembered, “The money from the sale was burning a hole in my pocket.” Craig wanted a more purpose-built Defender, one that could take on the rocky trails at Moab. 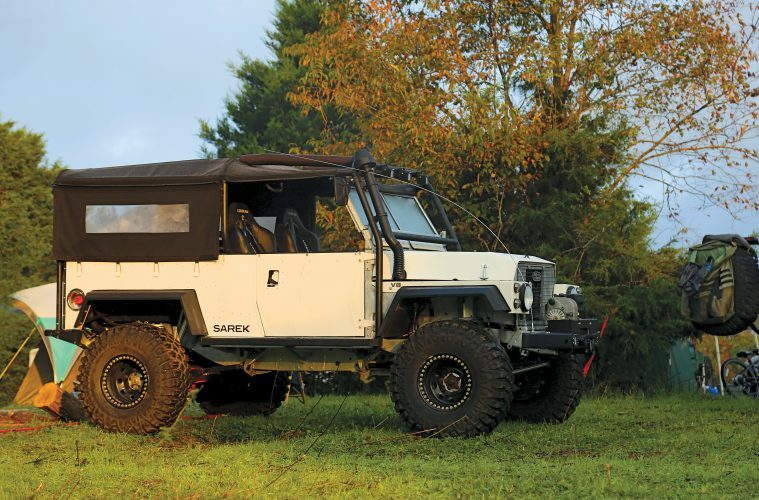 He began to formulate a plan when he learned that Ralf Sarek, of Sarek Autowerkes, Richmond, VA, had come into a stash of Series Lightweight parts. Ralf’s company had a well-deserved reputation as an independent Land Rover specialty firm that leaned towards sympathetic and brilliantly engineered enhancements. 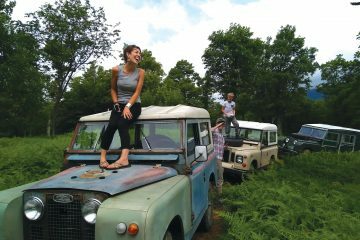 In between international work trips, Craig would unwind by wrenching on his new Land Rover. 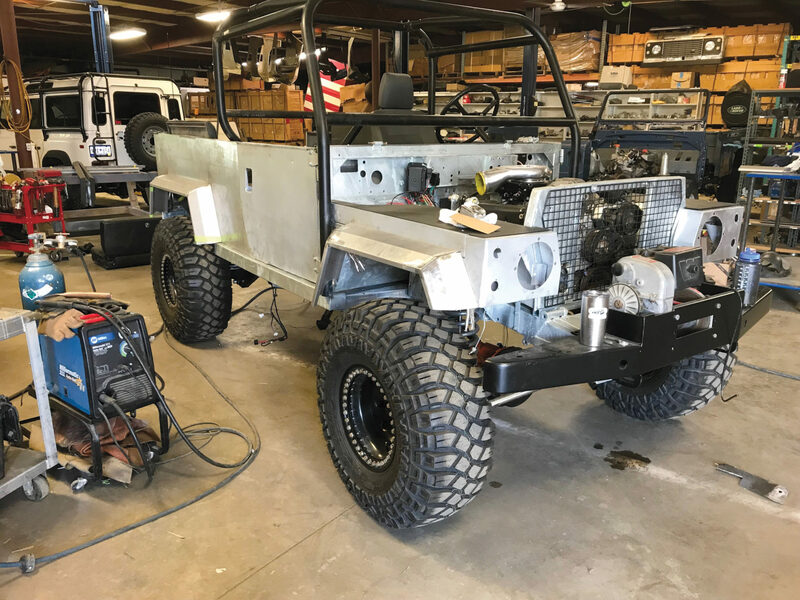 As is often the case, the Defender project morphed as Craig, Ralf and Brian Kanderfer of LRC Custom, Raleigh, NC, put their heads together. 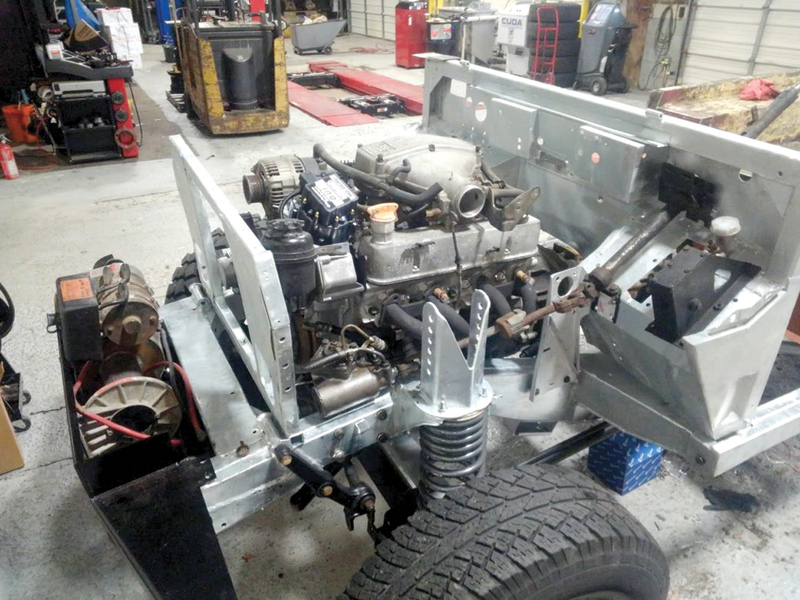 Craig noted, “We always wanted to stay true to Land Rover, but recognized the issues associated with old Land Rover V-8 engines and sought to circumvent them.” The Solihull Society’s National Rally in Moab last September set the completion date. 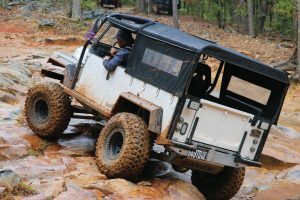 “For a rock crawler, I knew that as a minimum, I’d need a roll cage, front and rear differential lockers, and a torquey V-8. Ralf’s collection of Lightweight parts did not include a frame, engine or axles. 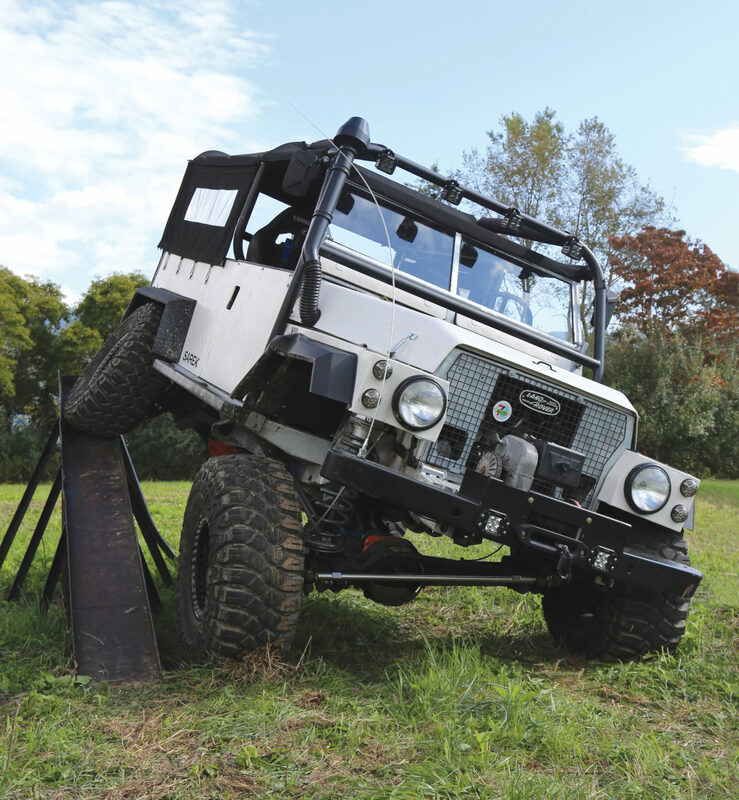 I wanted something longer than the Defender 90 frame Ralf had on hand, so he agreed to stretch it to 100”. 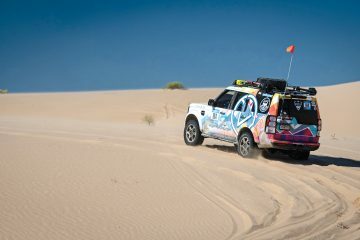 I wanted a Rover V-8, R380 transmission, lockers and 4:11 gears.” Good fortune smiled when a customer said he would sell a Discovery I with its manual, 5-speed R380. Several phone calls later, Craig had his frame, motor, transmission, and axles. Craig and Ralf turned to Brian Kandefer to stretch the body, paint it, design and fabricate a roll cage. Brian’s recommendation to stretch the cab and not the tub won approval and he constructed a custom seat box and hand-crafted body panels. 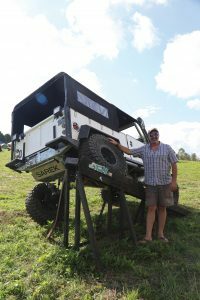 This provided Craig plenty of elbow and leg room, surpassing any stock Series and Defenders except for the 6×6 Perentie’s created for the Australian military. While the bodywork was underway, Ralf and Craig debated the drivetrain setup. Craig wanted to retain the inset breakfast [radiator] panel of the Series Land Rover, which forced Ralf to come up with a very clever solution for the radiator’s location — underneath the seat box. He designed a custom radiator that used a downdraft [pulling] electric fan. As a BMW specialist, he knew a BMW computer connected to a BMW electric water pump would prevent the V-8 from overheating and do away with the water pump and fan clutch on the ’95 3.9L GEMS V-8. “Now on a roll, Ralf sent me a photo one day with an armful of 14CUX wires, pipes, and manifolds, and said, ‘You don’t want these back on, do you?’ His ingenious plan was to use a Holley Sniper ER kit and a DUI distributor, which he said would increase horsepower and overall performance while assuring reliability,” said Craig. Craig’s time with Series Rovers had him concerned about the heat output of the Rover V-8 and the amount transmitted through the bulkhead. 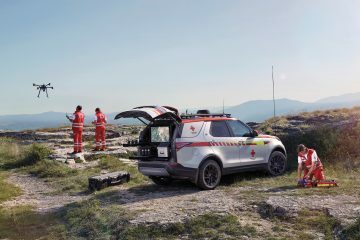 “As most friends know, I have always wheeled in flip-flops to feel the foot controls better and the heat pouring out of the bulkhead,” he noted. Craig spent many days researching solutions, settling on a Lava exhaust wrap favored by hot rodders, as well as a Dynamat-type product. 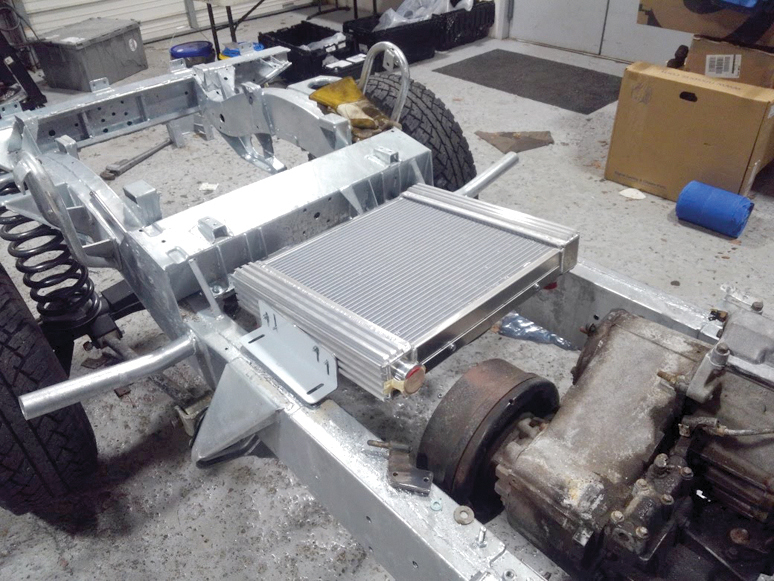 He spent days applying the heat-reducing and sound-deadening to the entire underside and bulkhead — and yes, it’s worked perfectly. The next design decisions came with the suspension. Collectively, we determined that a 2” lift would be ideal. 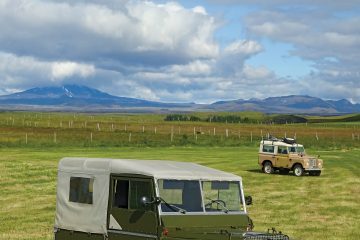 Sarek’s Ben Shelton worked on creating customized shock absorbers that would work with the Safari Gard, three-link setup Craig found online. Ben arranged with RTE to create custom rear links using heim joints on the rear trailing arms; their fabrication also assured zero-resistance in the rear bushings to further improve articulation. They also designed and created the custom springs and shock valving. Craig had found beadlock wheels online and had Maxxis Creepy Crawler tires.